With that one there is no measuring for you to do and yet the result is very pretty. A little more challenging but they will add even more interest to your folds. And this is yet one more idea for you to try.... scroll down and follow the steps. That way you will always have a reminder of the steps you need to take to make the card again in the future. 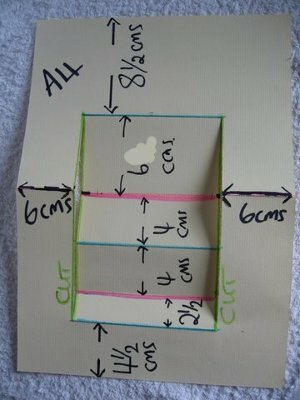 This will give you a central panel 16.5 x 11cms, (Approx 6 1/2" x 4 5/16") and is where all the steps will be. 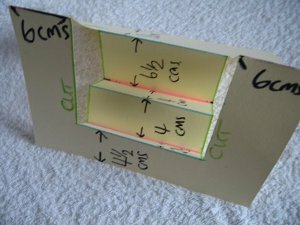 From the 4.5cms line measure up 2.5cms, from that line measure 4cms, and from that line measure 4cms, from that line measure 6cms, the piece that is left should be 8.5cms. All these need to be scored ready to fold. The photo shows you how it should be marked. I have shown the top and bottom marks in blue and these will be mountain folds, but not yet. The green line shows you where you need to make your cuts to seperate the steps from the end panels. The blue lines are all mountain folds, and the pink lines are valley folds. The black lines are where the two outer panels will be a tent fold. This shows you how it will look once the folds have been made. 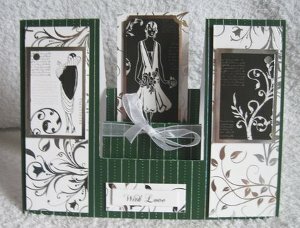 The Centre Step Card card can be made for any occasion and can look stunning when dressed up with any Embellishments that you have in your "Stash"
Both this and the Side Step Card look more complicated than they are, so I hope you won't be put off and will give all the variations a try. But if measuring is not your cup of tea then this Video Tutorial will show you the simplified version of the Stepper Card, and then you can leave the ruler and pencil in the drawer.